Prior to the terrorist attacks of September 11, 2001, security screening at the more than 400 major commercial airports around the United States was the work of personnel employed by private firms that contracted with airlines. One outcome of the attacks was the Aviation and Transportation Security Act (ATSA), signed into law by President George W. Bush on November 19, 2001, which placed security screeners under the control of the newly created Transportation Security Administration (TSA). Early assessments of the new program were uneven, and TSA has encountered a number of challenges in what has proven to be one of the largest mobilizations of a civilian agency in U.S. history. The fact that ATSA was written and passed just two months after the terrorist attacks serves to indicate the intensity of concern over air safety that prevailed in early fall, 2001. In fact, the bill would have passed even more quickly if it had not been for the thorny question of whether the government or private enterprise should control security screeners—and, assuming government control, whether Transportation or Justice was the department better suited for this task. Also symptomatic of the post-September 11 atmosphere was the spirit of bipartisanship that pervaded the debate over ATSA. Arguments were as heated as ever, but instead of the usual division between Republicans and Democrats, this time the disagreement was between the House of Representatives and the Senate. All agreed that the old system of airlines hiring security screeners and baggage handlers had to be changed and that a new ticket tax would pay for the new federal service. Legislators in the House, however, maintained that the Department of Transportation should hire security contractors, whereas their counterparts in the Senate favored a situation in which the Department of Justice would oversee a program made up of government employees. In the end, the two houses agreed on a compromise. Over the year that followed passage of the bill, screeners under the employment of the federal government would be phased in at 419 commercial hub airports nationwide. At the same time, up to five airports would participate in a trial program whereby they could use private contractors. After two years, all airports would be permitted to use private contractors under federal supervision, assuming they received approval to do so from the Department of Transportation. As the debate took place on Capitol Hill, many supporters of free-market economics maintained that private enterprise could inevitably do a better job than government. Yet, the World Trade Center attacks had occurred when private firms were utilized at airports, and as legislators debated ATSA, two companies had already come under scrutiny for alleged violations of federal law. In one case, for instance, the Transportation Department found that a security company had failed to conduct background checks, and had hired screeners with criminal records. As of January 2002, TSA had just 13 employees, but by November 2002, a year after the passage of ATSA, there were 47,000 newly trained federal security screeners at airports nationwide. TSA spokesman Robert Johnson compared the mobilization to the rush of enlistees that followed U.S. entry into World War II in December, 1941. Others were not as sanguine in their appraisal. Representative Harold Rogers (R-KY) maintained that the average screener at his home facility, Kentucky Bluegrass Airport in Lexington, processed just four people per hour. There were other concerns as well. According to Transportation Department assistant inspector general for auditing Alexis Stefani, security companies had begun increasing their fees once the government, rather than airlines, was paying the bill. Some of this money went toward increasing the notoriously low pay of airport screeners, which had been about $10,000 a year, to somewhere between $23,600 and $35,400. But, as one company had nearly doubled the rate it charged the government, it had increased employee pay by less than half that much. Adding to TSA's challenges with the screener program were several legal battles. ATSA had contained a clause barring non-U.S. citizens from employment as airport security screeners, but in November, 2002—just as the newly mobilized screeners went to work—a federal judge in California found the ban on non-citizens unconstitutional. Meanwhile, the American Federation of Government Employees (AFGE), a union of government workers, had attempted to unionize security screeners, a move TSA officials blocked on grounds that a grant of collective bargaining rights to screeners could jeopardize national security. AFGE leaders vowed to continue the effort to unionize the screeners. Beginning December 31, 2002, all checked bags were supposed to be screened for bombs, but as the deadline approached, it was clear that TSA would have difficulty meeting it. Screeners had already begun a practice of matching bags to passengers—that is, ensuring that for each name listed as the owner of the bag, there was a passenger with that name. Bag matching had been a practice on international flights since the 1980s, but many critics maintained that it would do nothing to stop suicide bombers such as those who perpetrated the September 11, 2001, attacks. 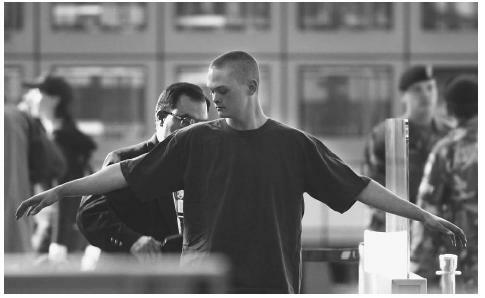 A security screener uses a magnetic wand to check a passenger at Chicago's O'Hare International Airport in February, 2002.
items that they contracted with scrap-metal companies to haul away all the knives, scissors, and other sharp items confiscated. Passengers did not have to give up these items permanently, assuming the item was not illegal in the first place, and some airports had facilities for travelers to mail home items that they could not take on planes. In contrast to these challenges and the dim prognoses offered by some critics, there was much about the federal screener program that pointed to success. The rockiness of its early months was considered inevitable in light of the monumental task administrators faced after September 11. Clearly, a mobilization such as the one required to federalize the screener program can only be properly evaluated after several months or years, not just a few weeks. Croft, John. "Air Security Bill Clears Lawmakers' Logjam." Aviation Week & Space Technology 155, no. 21 (November 19, 2001): 46. Goo, Sara Kehaulani. "Security Law Called Unconstitutional." Washington Post. (November 16, 2002): A12. ——. "Security's Growing Leftovers: Confiscated or Forgotten Objects Piling Up at Country's Airports." Washington Post. (February 4, 2003): E1. Lee, Christopher, and Sara Kehaulani Goo. "TSA Blocks Attempts to Unionize Screeners." Washington Post. (January 10, 2003): A19. Miller, Leslie. "Some Airport Screeners Raise Rates." San Diego Union-Tribune. (August 27, 2002): A7. ——. "Deadline Met for Airport Security Screeners." San Diego Union-Tribune. (November 17, 2002): A2. Wald, Matthew L. "Some Busy Airports to Miss Deadline for Scanning Bags." New York Times. (November 19,2002): A23. Transportation Security Administration. < http://www.tsa.gov/public/ > (March 5, 2003).